Need a quick and easy routine to warm up those glutes? We’ve got you covered! For this video, Mareike demonstrates an old time favorite booty workout with a new twist: banded squat kickbacks! Watch and learn how she uses Belus Active loop bands in increasing the intensity of the squat kickbacks, thus resulting quickly in a better booty shape. 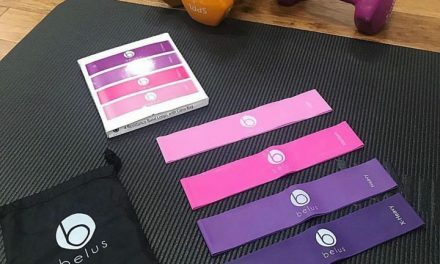 So what do the Belus Active loop bands do to your workout? By adding resistance, it increases the force you have to push. And when you do banded squat kickbacks with resistance, the further your glutes push back. You’ll use more energy and that means you can form your booty more efficiently! It also helps in building strength minus the heavy weights. Now it is no longer your ordinary squats + kickbacks, but Belus Active’s intense squat kickbacks! It won’t stop there. If you want more challenge, you can even increase the resistance by adding another band–double trouble, twice the effectivity! The good thing about Belus Active loop bands is you can combine any of the four different levels of resistance. If you feel like you’re in between the levels, this is your chance. You can create a customized level of resistance suited for your own fitness capability. Every movement contributes to the realization of your fitness goals. You need to make sure that you do it right at all times. Getting the most out of your daily routine requires help from reliable equipment and the proper knowledge of using them. But making sure that you do your workout for the day is not enough. You also have to do it right by getting the proper form. Even if you workout really hard, repetitions are not enough. It won’t be twice as effective as compared to those who uses support materials. So make sure you do your repetitions, practice proper form, and get enough rest and nutrients. Without those, your exercise won’t be enough to transform you into your fittest self. Belus Active bands can help you take each exercise to the next level, helping you hit your target in no time. the brand is committed in offering the best resistance equipment to suit different fitness needs and workout capacity.